Nuvali in Laguna is a multipurpose development with residential communities and commercial establishments located outside the Metro Manila. Just recently, a new space was opened to give its residents and visitors something new to add on must-try when in Nuvali. We visited Camp N Nuvali when my friend, Riva, decided to do pocket birthday celebrations. She wanted to celebrate for a week and to set for her friends a get together with activities outside her comfort zone. I went to this one. 2 2. Who is Camp N for? 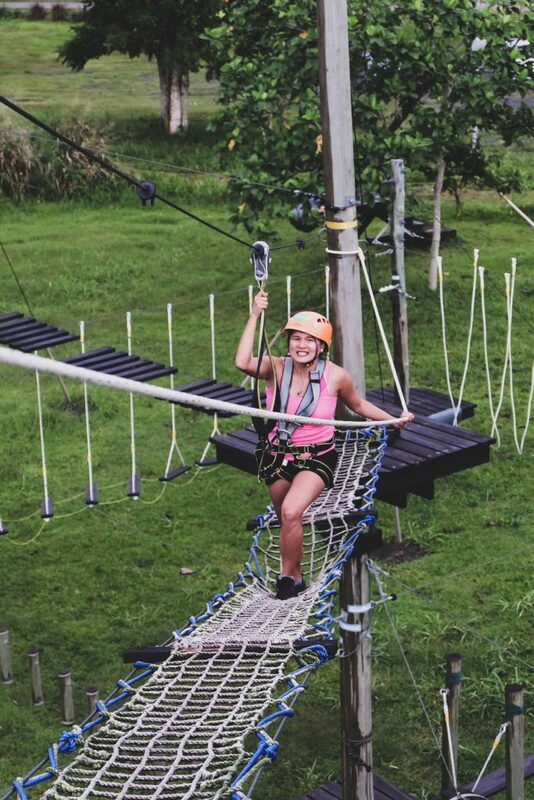 Camp N is a new park that offers different outdoor activities. These activities include physical, emotional and intellectual challenges. Through these, you will be able to tackle your fears, your strengths, and your teamwork skills. And, be able to make improvements with your relationship to yourself and to others. 2. Who is Camp N for? 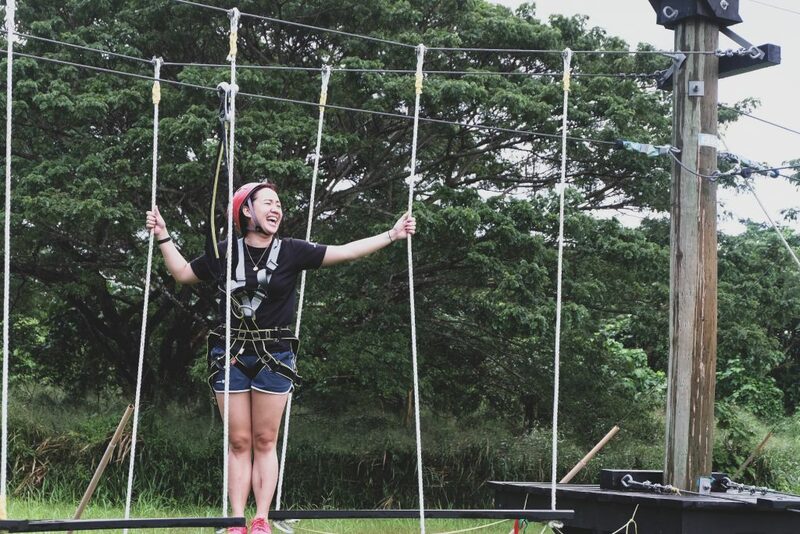 This obstacle course venue is ideal for a corporate team-building event, for a get-together activity with a group of friends and for adventurous souls. I also saw some kids trying out some obstacle courses. So, this place is a good bonding place for families too. 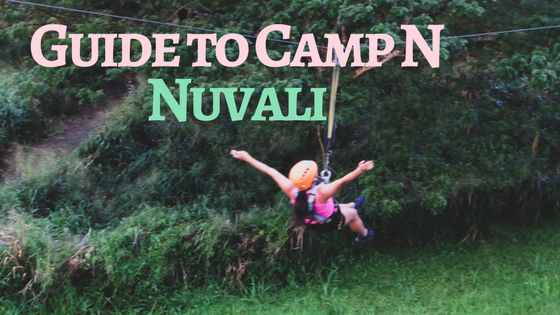 Camp N is located inside the Nuvali, a multipurpose development sitting in the vicinity of Sta. Rosa, Cabuyao and Calamba, Laguna. From Alabang, Muntinlupa, travel time usually takes 30 to 40 minutes. Via South Luzon Expressway (SLEX), you can take the Sta. Rosa-Exit. Then, turn right to take the Sta. Rosa-Tagaytay Road. You’ll pass by Paseo – Sta. Rosa Mall. After you pass by Vista Mall – Sta. Rosa Mall, you can turn left to take the Nuvali Boulevard. Just drive straight ahead. After passing the Avida Setting which you can find on your left, take the right road. Then, take another turn to your left which leads to Camp N.
Point to Point (P2P) bus services going to Nuvali are available at Circuit Lane, and Glorietta 2, Palm Drive, both in Makati City. The bus fare cost P 250. You can take a bus at Pasay City near LRT Buendia Station going to Balibago Terminal. The bus fare may cost around P 61. Alternatively, you can ride a van going to Balibago Terminal which is available in front of the Starmall EDSA-Shaw. This may cost you around P 81. Then, from Balibago Terminal, you may take a Tagaytay-bound jeepney which can drop you off at Nuvali. The jeepney fare may only cost around P 17. It is best to be dropped off in front of Nuvali Terminal, right next to Robinsons Supermarket, Solenad 2, Nuvali. In the Nuvali Terminal, you can take a shuttle heading straight to Camp N.
Camp N recommends that you wear tight but comfortable clothes especially if you’re a woman. Women can wear something like leggings, sports bra, tank top, or your yoga outfit. Just make sure you’ll be able to comfortably move with your clothes. Don’t also forget to tie or clip your long hair. Then, men can wear t-shirts, shorts, or pants in which they’ll also be comfortable to move around with. For footwear, Camp N only allows closed-toed shoes. You may also wear a cap since chances are that you’ll be doing the activities under the heat of the sun. And, don’t wear any jewelry. 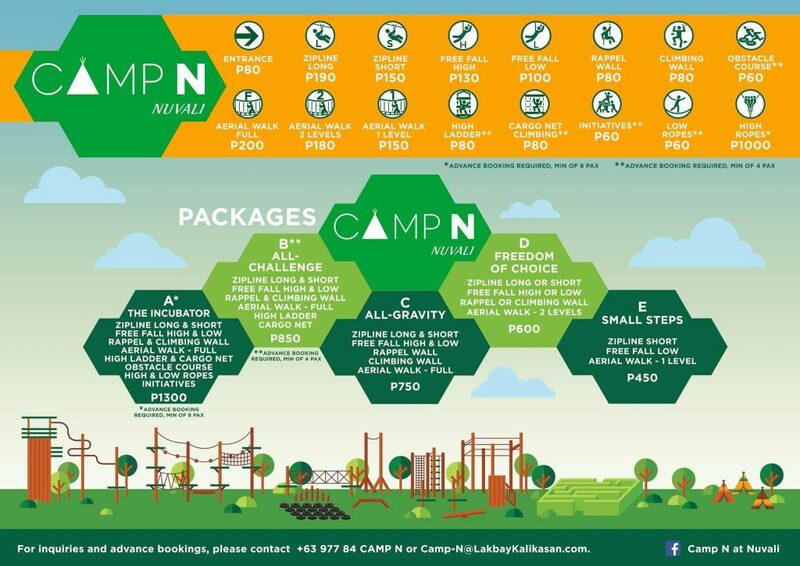 At Camp N, the Entrance Fee cost around P 80. 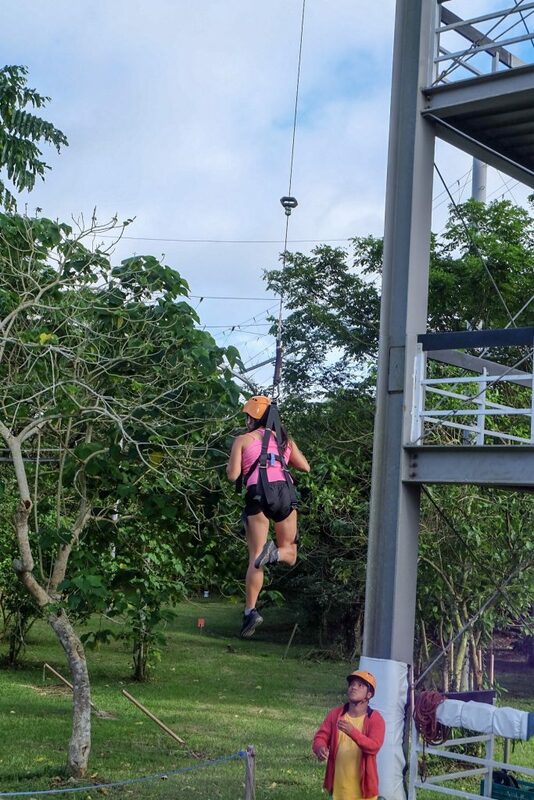 You can enjoy different outdoor activities by paying for separate rates which start at around P80 or by paying for a package rate which starts at a more or less P 450 up to P 1,650. Some activities have a minimum guests requirements and a three-day advance booking. 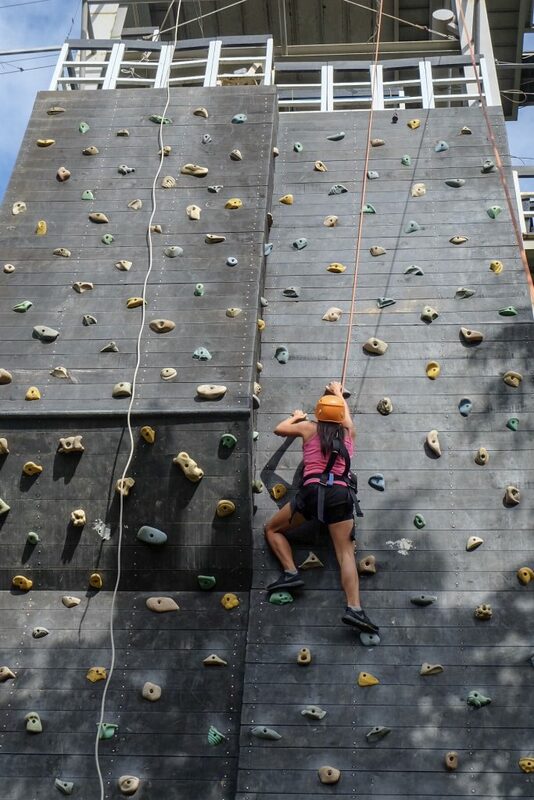 The outdoor activities that Camp N offers include an obstacle course training ground, rope challenges, freefall challenge, wall climbing and rappelling, archery, and bike trail. I find all the lower ones are more extreme than the higher levels. 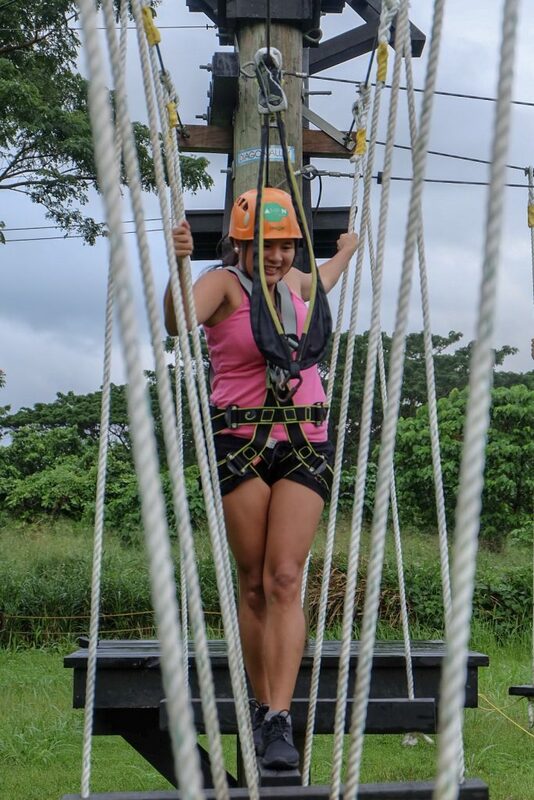 Face your fear of heights in the Free Fall Low activity. More extreme but this isn’t like a bungee. It was actually really easy you just have to let go. The free fall feeling isn’t bad. It’s like falling fast in an elevator. It’s quick. It’s like your first stage before bungee jumping — not as scary but more like standing on the edge of a somewhat 4th level of the tower and jumping. The tower where you can free fall also has a wall climbing and rappelling area. It is ideal both for adults and kids who are eight years old and above. When I am asked about whether to take the extreme or a safe call, my usual answer is that ‘why go for short when you can do long!’ I’m glad I tried both because I was able to compare them. I liked the short better. 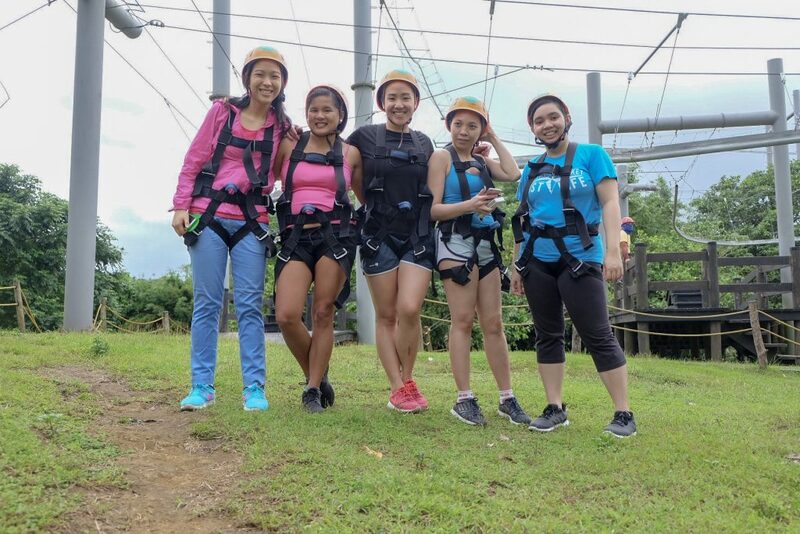 It’s different from the usual zipline wherein you just sit and cruise or lay and cruise. This one has dips — similar to roller coaster tracks. It was fun. The long one seemed long and scenic with 1 or 2 dips. The short was more exciting and adventurous, for me, at least it had 3 exciting deeper dips. We did the full aerial rope challenge. Each level is a different challenge — may it be core, balance or strength. Glad that I was with my friends and that we were doing everything together. We just supported and motivated each other. It was fun. Loved this. Too bad we didn’t get to do the obstacle course. You have to call 3 days in advance for this. It requires a minimum of 6 participants as well. Obstacle course includes going through, among others, apex ladder, wall run, series of log balance beam, cargo climbing net. Test your vision skills and muscle strength through archery at Camp N. Here, they’ll let you use a sleek wooden bow. And, they’ll teach you how to hit the target. Rope Courses at Camp N will test your balancing and endurance. As you progress, you’ll get to reach higher platforms. Then, you’ll finish the rope challenges with series of zip lines. Cargo Net and High Ladder are two separate obstacle courses. Both posed challenges as they stand vertically and really high. Camp N offers bike tutorial for beginners and for those who still want to improve their skills. Here, you can rent a bike or bring your own bike. You may also check the Facebook page of Camp N to see their event schedule more particularly for group bike ride. Another thing to watch out for is their camping ground which is yet to be opened.